Bodie State Historic Park is a genuine California gold-mining ghost town. You can walk down the deserted streets of a town that once boasted a riproaring population of nearly 10,000 after a major gold strike in 1875. Only a small part of the town survives, preserved in a state of "arrested decay." Interiors remain as they were left and stocked with goods. The park is northeast of Yosemite, 13 miles east of Highway 395 on Bodie Road (Highway 270), seven miles south of Bridgeport. Mono Lake, just east of Highway 395 in Lee Vining, is naturally salty and alkaline because it has no outlet. It also is very old -- at least 700,000 years old, which makes it one of the oldest continuously existing lakes on the continent. Mono Lake's striking phenomena include the tufa (pronounced "toofah") towers visible along the shoreline. Tufa were formed from calcium carbonate that makes its way into the lake from underground springs. Declining lake levels have exposed the tufa towers now visible. The lake's impressive visitor center is 100 miles north of the Mt. Williamson Motel and Base Camp. Yosemite is internationally recognized for its spectacular granite cliffs, waterfalls, clear streams, Giant Sequoia groves and stunning scenery. Yosemite was central to the development of the national park concept, largely owing to the tireless efforts of John Muir, Galen Clark and others in getting the Yosemite Grant passed by Congress and signed by President Lincoln, paving the way for the United States national park system. More than 3.7 million people visit Yosemite each year. The Ancient Bristlecone Pine Forest is high in the White Mountains in Inyo County. Great Basin Bristlecone Pine (Pinus longaeva) trees grow between 9,800 and 11,000 feet above sea level, in xeric alpine conditions, protected within the Inyo National Forest. The Methuselah Grove in the Ancient Bristlecone Pine Forest is the location of the Methuselah, a Great Basin Bristlecone more than 4,750 years old. This is 1,000 years older than any other tree in the world. The Ancient Bristlecone Pine Forest is generally open from mid-May through the end of November, weather permitting. Directions: Take Highway 395 to Big Pine and go east on Hwy. 168 13 miles to White Mountain Road. Turn left (north) and drive 10 miles. The forest visitor center is 49 miles from the Mt. Williamson Motel and Base Camp. The historic Mt. 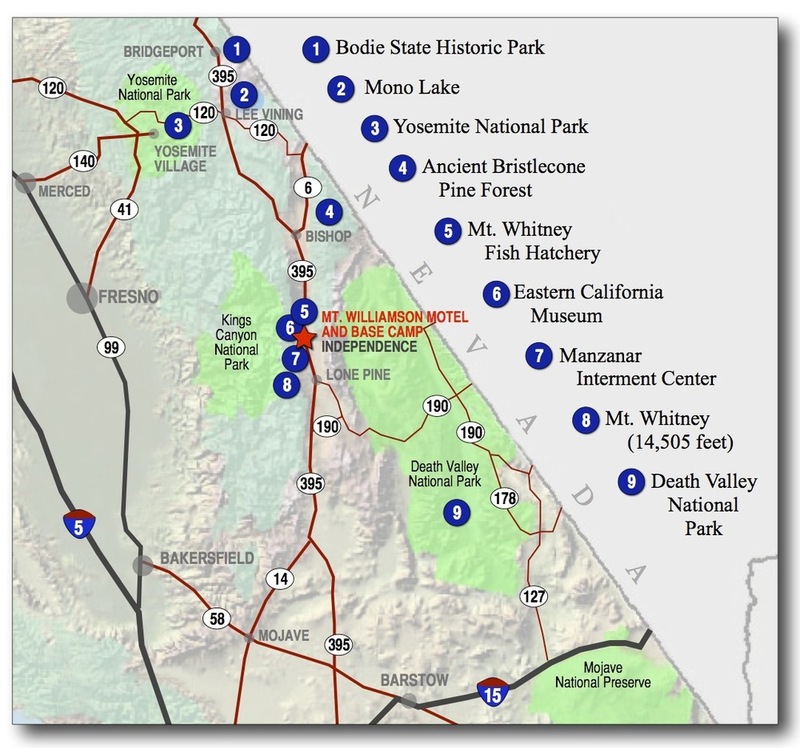 Whitney Fish Hatchery is just a few miles from the Mt. Williamson Motel and Base Camp. The Mount Whitney Fish Hatchery is a few miles north of Independence on Highway 395. The fish hatchery has played an important role in the preservation of the golden trout, California's state fish. When construction was completed in 1917, it was the largest and best equipped hatchery in California and could produce 2 million fish fry per year. While fish production at Mt. Whitney Fish Hatchery was eliminated in 2007 as a result of a fire and consequent mud slide, you can visit the hatchery grounds Thursday through Monday from 10 a.m. to 4 p.m. It is a wonderful spot for a picnic. The mission of the Museum, which was founded in 1928, is to collect, preserve, and interpret objects and information related to the cultural and natural history of Inyo County and the Eastern Sierra, from Death Valley to Mono Lake. A computerized database with more than 15,550 records is used to manage its extensive collections. In addition to those artifacts, the Museum houses some 27,000 historic photographs of the Eastern Sierra region, the majority of which date from the late 1800s through the 1950s. The museum was founded in 1928. It is open daily and weekends, except for holidays and admission is free. It is at 155 N. Grant St. in Independence, just west of Highway 395. In 1942, the U.S. government ordered more than 110,000 men, women, and children to leave their homes and detained them in remote, military-style camps. Manzanar War Relocation Center was one of 10 camps where Japanese American citizens and resident Japanese aliens were interned during World War II. Manzanar is 9 miles north of Lone Pine and 6 miles south of Independence and the Mt. Williamson Motel and Base Camp. Since the last incarcerees left in 1945, former incarcerees and others have worked to protect Manzanar (which means "apple orchard" in Spanish) and to establish it as a National Historic Site to preserve and interpret the site for current and future generations. At 14,505 feet (4,421 meters), Mt. Whitney is the highest summit in the lower 48 states. It is just 84 miles from Badwater in Death Valley, the lowest point in North America at 282 feet below sea level. The summit is the southern end of the John Muir Trail, which runs 211.9 miles from Yosemite Valley. Mt. Whitney is west of Lone Pine on Highway 395 and is most easily accessed by the Whitney Portal Trailhead (8,365 feet), 13 miles east of Lone Pine and 28 miles from the Mt. Williamson Motel and Base Camp. All hikers entering the Mt. Whitney Zone, including day hikers, are required to obtain a permit -- either your park wilderness permit if you are entering the zone from the west or an Inyo National Forest Whitney Zone permit if you are entering from the east. In this famous (infamous to some) below-sea-level basin, steady drought and record summer heat make Death Valley a land of extremes. Yet, each extreme has a striking contrast. Towering peaks are frosted with winter snow. Rare rainstorms bring vast fields of wildflowers. Lush oases harbor tiny fish and refuge for wildlife and humans. Despite its morbid name, a great diversity of life survives in Death Valley.